Volkswagen introduced the sixth-generation Transporter van a few months ago, ushering in a new era for the once-iconic VW bus. But the Transporter isn't the only version Volkswagen Commercial Vehicles bases on its core van chassis. 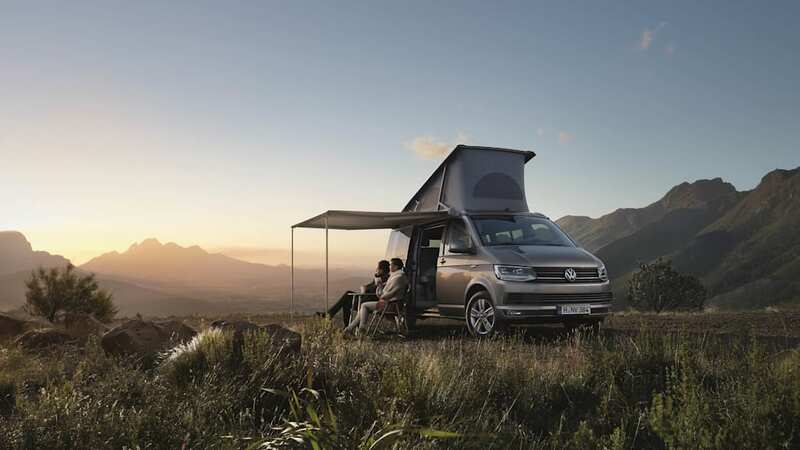 It also offers the Caravelle, the Multivan, and this, the new the California camper. Based on the T6, the latest California is now being rolled out for what you might call "outdoor recreation enthusiasts." Depending on which configuration you choose, it can fit up to seven people on the road and sleep up to five. VW has thrown everything into this van, literally including the kitchen sink. It's also got beds, a pop-top, and a dual-burner gas range. 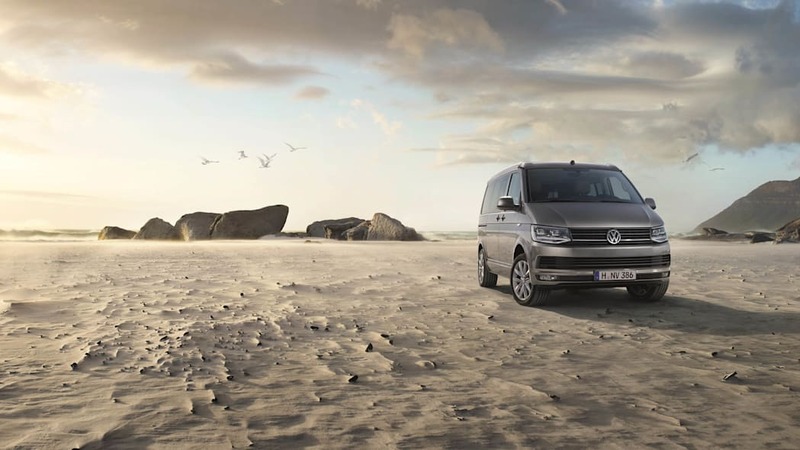 The new VW California can be had in three trim levels (dubbed Beach, Coast, and Ocean) and with a range of gasoline and diesel powertrain options. That is, where it can be had, because despite the name, the California (like the rest of VW's commercial vehicles) isn't actually offered in California or any of the other 49 states in the Union. The California is now available in three equipment lines: Beach, Coast and Ocean. The California Beach is the entry-level model. It is the perfect combination of a 7-seat passenger car and a motorhome with up to five berths. Equipped as standard with a manual pop-up roof and two different layouts (double reclining bench seat with storage compartment or folding triple bench seat with multiflex board), it provides the ideal base for everyday life and travelling. Naturally, the integrated roller blinds enable the creation of privacy and shade, just as the ability to turn the front seats around enables driver and passengers to sit together in a cosy seating group. In combination with the removable camping table within the sliding door and the folding chairs in the tailgate, you are always equipped for outings of all kinds. New to the range is the California Coast. 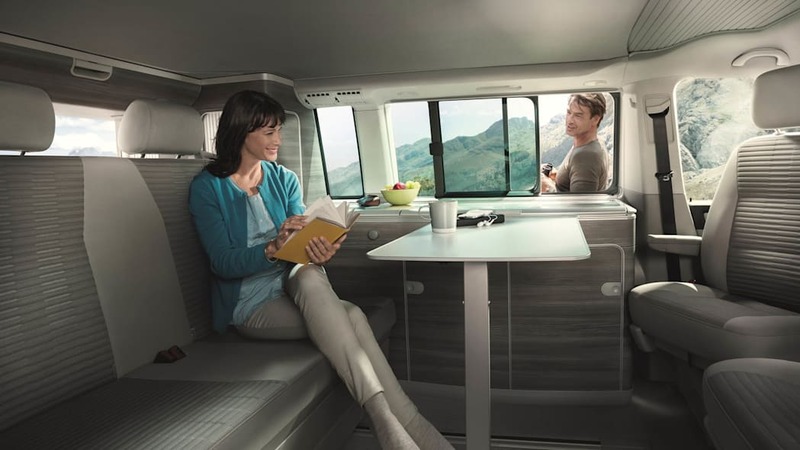 With a manual pop-up roof and an aluminium row of units in pale wood trim, it is more motorhome than passenger car, but without losing any of the high level of everyday practicality. With up to five seats, it shows how cleverly thought out the California concept is. 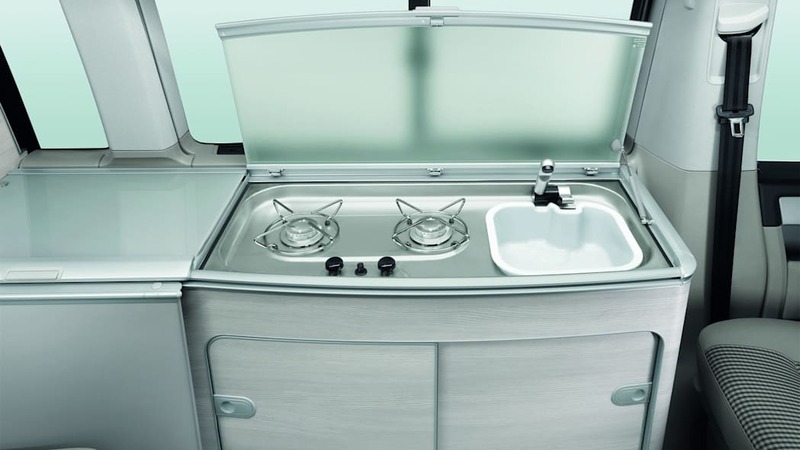 The galley with stainless steel sink, 42-litre cool box with clip-in basket and twin-hob gas cooker with Piezo ignition, coupled with lots of storage space, facilitates comfortable living even on extended journeys. The California Ocean offers very comprehensive standard features, including auxiliary heating, Climatronic, double glazing, closing aids and much more. The pop-up roof is operated by electrohydraulic power, rising and lowering at the press of a button. The new dimmable LED lighting in the pop-up roof and tailgate produce a whole new feel-good ambience inside the vehicle. 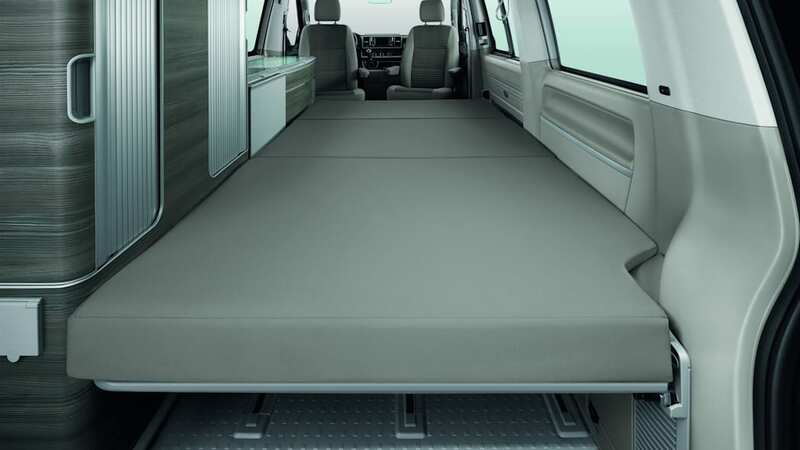 A key fundamental feature of the California range – besides the convertible, multifunctional interior and integrated accessories – is the fold-out double bed on the 'first floor'. The pop-up roof with a sleeping area of 1.2 x 2 metres and the proven layout with a folding bench seat in the back, which if needed can be laid flush to form a bed, and, depending on equipment line, a slim row of kitchen units with cool box, gas cooker, sink and storage space on the left-hand side, has therefore been retained. The vehicle height remains at practical 1.99 m on all three models.This successful concept has been made better still with enhancements to detail. However, small details have been thought of as well. There is now, for instance, a multi-functional holder for the rear compartment. It is a cup, ashtray and towel holder all in one. A minor feature perhaps, but one that shows the designers' attention to detail in this upgrade. The integrated accessories, such as camping chairs and table, can be stowed away in space-saving fashion and firmly secured, but are never in the way and always with you on board. In addition, the California models have, either as standard or as options, all of the numerous innovations of the latest T-series generation – including driver assistance systems, the latest infotainment with 'App Connect' and adaptive suspension. Travelling is thus made even more comfortable, safe and entertaining. The latest generation of engines provides in each instance exceptionally low fuel consumption (from 6.3 litres / 164 g/km) – without losing any of the joy of driving. All of the new TDI engines – from 62 to 150 kW – fulfil the Euro 6 emissions standard and have BlueMotion Technology with engine stop/start. Across the whole model series, the new engines save a litre of fuel compared to the previous generation. All in all, consumption has been reduced on average by 15% per cent. By the autumn further engine and gearbox combinations – DSG and 4MOTION all-wheel drive – and two petrol engines delivering 110 and 150 kW respectively will be incorporated into the range of models available. Since the launch of the California model in 1988, every generation has seen its popularity grow. In the T3 version 22,000 California models were produced and in the T4 version 39,000. The T5 version the Volkswagen California achieved a production record of over 50,000 vehicles.